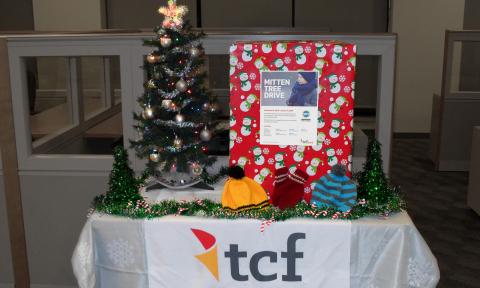 WAYZATA, Minn. & MILWAUKEE--(BUSINESS WIRE)-- TCF Bank, a subsidiary of TCF Financial Corporation (TCF) (NYSE: TCF), and Milwaukee Public Schools (MPS) today announced that they are accepting donations of new and gently used hats, scarves, gloves and mittens to support the Mitten Tree Drive. For the fourth, consecutive year, collection sites are located at each of TCF Bank’s 10 branches in the Milwaukee area and at MPS Central Services. To learn more about the annual Mitten Tree Drive, please visit http://mps.milwaukee.k12.wi.us/en/Community/Get-Involved/Mitten-Tree-Drive.htm.